It is known that many heavy-duty vehicles (HDV) circulating on European roads may have some form of emission control manipulation. These vehicles constantly cross the borders of many countries, making the problem a very serious, one that must be resolved by all Europe together. The most common manipulation is to disconnect the AdBlue injection that reduces NOx emissions in diesel trucks. This is done thanks to the so-called "AdBlue killers", which can be purchased for a very low price on the Internet and can be easily installed in the truck. The AdBlue killer makes the computer believe that it is injecting AdBlue when it is not being done. They save the cost of the AdBlue, increase the power of the truck and, above all, as they stop using the SCR, they extend its useful life, since its maintenance costs are very high. The most sophisticated manipulations, especially carried out on Euro 6 trucks, are carried out purely by software, so it is not possible to find a cheating device in a visual inspection. In other cases, the device may be very well hidden and finding the infraction is cumbersome. These NOx manipulations are always hard to find, and the only option is catching the cheaters in the act: on-road inspections, measuring their real-driving emissions. Additionally, coordinating a police deployment to find these cheaters is complex and randomly pulling over trucks is not efficient. The Remote Sensing Devices (RSD) have proven to be very useful to find suspicious vehicles in real-time, helping law enforcement authorities to find suspects based on their measured emissions. “[…] rules for testing and/or checking braking systems and exhaust emissions during a technical roadside inspection. The use of equipment is not mandatory during roadside inspections. However, it is “recommended”, due to it enhancing the quality of inspections”. In the Annex: “[…] measurement using remote sensing equipment and confirmed by standard test methods”. “Remote sensing measurement showing significant non-compliance”. Therefore, the traffic authorities must perform roadside inspections of commercial vehicles to check their emissions. The European Commission details that remote sensing equipment can be used for this purpose and that significant non-compliance of emissions measured by the RSD is by itself a prove of defect of the vehicle. Opus AccuScan™ RSDs remotely measure exhaust emissions from motor vehicles as they are driven past the remote sensing device on streets and highways. 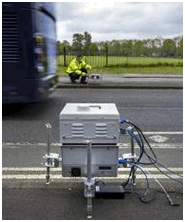 The emissions are measured spectroscopically by casting a narrow infrared (IR) and ultraviolet (UV) beam of light across the road and through the trailing exhaust of passing motor vehicles. A mirror then reflects the IR/UV light back to a series of detectors that measure the amount of transmitted light at characteristic wavelengths absorbed by the pollutants of interest. By subtracting any pre-vehicle background absorption from the amount of IR/UV light absorbed by the various tailpipe pollutants, the system can determine the pollutant levels in the vehicle’s exhaust. As the emissions are measured, the video camera captures a digital image of the license plate and the speed/acceleration sensors record the speed and acceleration of the vehicle. The emissions, weather conditions, slope, speed and acceleration data as well as the license plate image are merged within less than a second to complete a measurement record which is then stored in a computer database for future analysis and reporting. The RSD can measure the emissions of vehicles circulating under real driving conditions. Since it takes only a second to capture a measurement, these devices can capture large quantities of vehicle emissions data in a short period of time. Also, since it is a non-intrusive technique, the RSD audits the circulating vehicles without interfering with the traffic flow, therefore it can audit an entire fleet in a short period and with no impact on daily operations. AccuScan™ RSDs have measured hundreds of millions of vehicles worldwide, far more than any other technology. Our factory and field certifications focus on ensuring every unit is measuring within accuracy and precisions tolerances. The Real-Time Validation software filters out any measurements that cannot be used with a high degree of confidence in monitoring or screening applications. The Post-Collection Filters further remove those measurements that might have been captured during operating conditions when the vehicle (by design) is unable to effectively control its emissions. Following these sequential stages of quality assessment, review, and control only the most accurate and representative measurements of the vehicle’s on-road emissions are used in analysis. Moreover, Opus RSE is worldwide the only ISO-17025 accredited laboratory for the unobtrusive remote measurement of real traffic emissions. This certificate is audited annually and proves that our company fulfills the requirements for testing and calibration as a laboratory. Therefore, our Remote Sensing activities are within the standards of a portable laboratory, ensuring the quality and precision of our processes and results. CIEMAT (Center for Energy, Environmental and Technological Research of Spain), Year 2015. IVL (Swedish Environmental Research Institute), Year 2016. JRC (European Commission's Joint Research Centre), Year 2017. ICCT (International Council on Clean Transportation), Year 2018. During the years 2017 and 2018 different projects have been carried out in Europe where Opus RSDs have been used to find NOx-cheaters in the act. The quick and easy deployment of the RSD has been fundamental to the success of these projects, as if these devices were installed in a fixed way, drivers could be aware of their presence and avoid being measured. 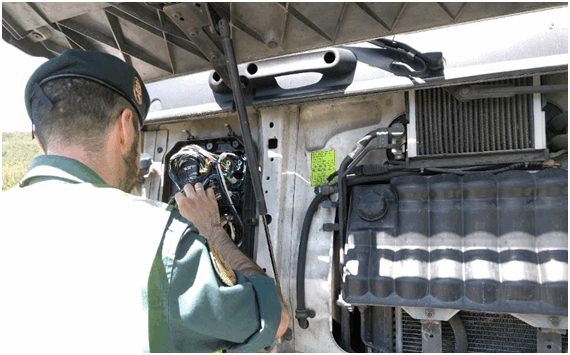 In September 2017 a pilot was done in Austria in collaboration with the national police authorities to find heavy-duty vehicles with NOx-cheating devices. The exercise was highly successful, as it first proved that the screening method with RSD works. Tampering devices were found in around 15% of the trucks inspected. The authorities were impressed and are now keen to use Opus Remote Sensing technology on a broad scale. Their approach is to dismantle trucks when pre-selected by remote sensing. In December 2017 another pilot was done in Denmark, close to the border with Germany. In this case the police deployment was very large, in a good location, near a border control point, where the trucks had to drive through a slightly constant positive slope road. The success was total, as 50% of the trucks that were measured by the RSD and pulled-over for inspection were cheating. The conclusion for the Danish Police was that the system and the methodology is valid. Since April 2018 a similar project is being done in Spain, in collaboration with the Spanish Police. 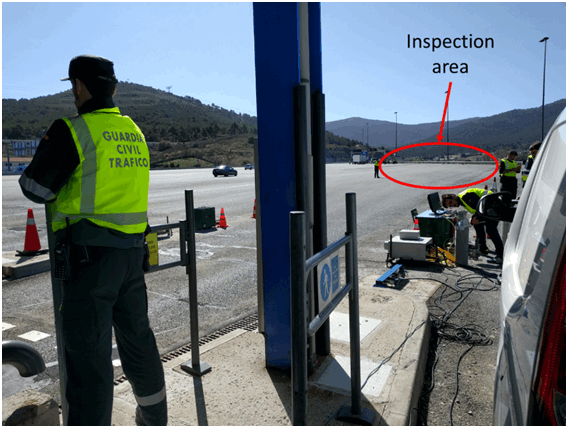 The locations are tolls, where the trucks are obliged to accelerate sufficiently and there is a large area to stop the trucks and inspect them in detail. The success is being very high as over 30% of the trucks that are surpassing the NOx limits when measured by the RSD, are being found to have some NOx-cheating devices. It is also believed that many trucks have software manipulations that could not be found on the spot. All these countries have expressed their satisfaction and pretend to continue using the technology for this application. Finding this infraction on the spot results in an immediate sanction to the driver, but also, if a repetitive act is found (e.g. owners of truck fleets carrying out this practice on a widespread basis), it is a criminal offence with prison penalties.